What Does Your Resume Font Say About You? There are a lot of decisions involved in constructing the perfect resume: what work experience to prioritize, what details to provide, what skills to exaggerate. 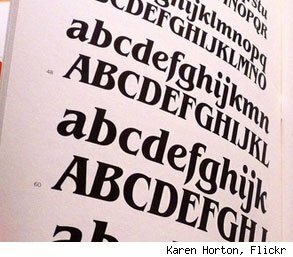 But one deal-breaking decision often gets slight attention: What font to use? To investigate this question, AOL Jobs spoke to Barbara Safani, owner of the career management firm Career Solvers and author of "Happy About My Resume," as well as two graphic designers: Kevin Poirer, the creative director of Massachusetts-based PearTree Design, and Ryan Clennan, the art director of D.C.-based Studio Grafik. In general, Safani recommends that resume-writers stick to generic fonts, because if your potential employer doesn't have your offbeat font in their Microsoft Office package, it will be converted, squishing or stretching or jumbling the whole document. She also advises against using serif fonts, because they don't survive so well when scanned. Safani: I personally hate Times New Roman. So many people use it, and when you write a resume you want to stand out. But it is one of the more universally accepted fonts. Poirer: It's a clean, professional font. Conservative. Clennan: Boring. It's the default. Safani: A resume is like expensive New York real estate; you're trying to put as much quality information on there as possible, without cramming it in. And Georgia's a little wide. Clennan: Not much better [than Times New Roman]. Safani: In certain situations, like a kindergarden teacher's resume, I might use it. Poirer: I'm trying to think what the best word to describe that awful font would be.... Let's say whimsical. Safani: It's already bolded and almost three-dimensional. Too overbearing. It might use it to highlight a certain section, like your professional identity, but I wouldn't recommend it for the whole thing. Safani: I like Arial. The lines are very clean. It doesn't have the serif. It's easy to read. Poirer: That's a modern font. Conservative, but modern. Clennan: Could be cool if used correctly. Safani: Not my personal preference. [Pausing as she scrolls through her fonts on Microsoft Word.] Well, I don't even have it. Clennan: The best font ever created. Safani: I don't even know what that is. Poirer: Mildly more interesting than Helvetica, but still unimaginative. Clennan: More modern, more hip, more up-to-date. Safani: That can date somebody. It looks like you did your resume on an IBM Selectric in 1980. Poirer: Their ideals are classic in nature. Clennan: Never to be used unless you're trying to create a typewriter look. Safani: I personally don't like Garamond. I think it's hard to read. But I know people who only use Garamond. It's almost too light. It's very thin. I think it's hard to make information stand out. Clennan: Of this list, it's the most professional. Safani: That's not really a font, is it? If you're putting that kind of stuff on a resume, there's no way you're going to be taken seriously. Poirer: You can't read it. It's a symbolistic font, so that would be a little James Bond. Clennan: That means you've been using a lot of heavy drugs. Safani: Nothing stands out. The idea is to use shading and bolding to position important information. Clennan: I would be afraid that you were going to attack. Safani: Same thing. And it's harder to read. Poirer: They're not well-trained in graphic design. Most agree that it's best to lean conservative in your font choice. But if you're applying for a job in the arts, like at a graphic design firm, you might want to choose something a little more unusual than Times New Roman or Georgia. There are ways, however, to showcase your personality other than the shape of your letters. "It can be done in the way the information is placed on the page -- images, links, even a little bit of color," advises Safani. "Even if you're creative, you still want the document to be easy to read." One in 5 American Men Don't Work: Where's The Outrage?